The soldier shown came into the VMCLI with his dog, Namfi, that was very sick and in need of a cholecystectomy (removal of the gall bladder). As he was due to return for his third tour in Iraq in just a few days, the family’s finances were tight, and they were unable to provide for Namfi’s surgery. 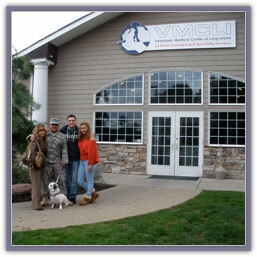 The VMCLI made Namfi our first patient to receive funding from the Veterinary Medical Center Animal Assistance Fund (VMCAAF). The picture shown is of the solider and his family picking Namfi up from the hospital after his procedure, ready to go home, only a day before the solider was deployed. God bless our troops! 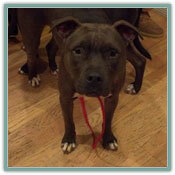 “Babe” is a stray pit bull being taken care of by the Town of Babylon Animal Shelter. 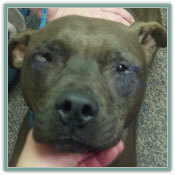 She needed Entropion surgery to correct her eye lids. 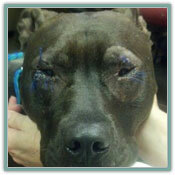 The Town of Babylon raised money to have the VMCLI perform a decreased cost surgery on her, and her other pitbull friend with the same eye lid problem, Buster. 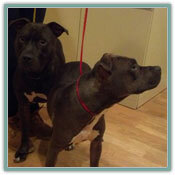 The pictures below are of both Buster and Babe before and after the surgery. 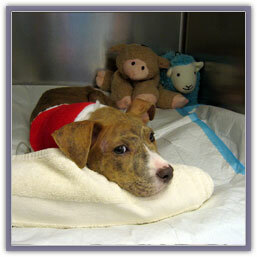 Joey was a 3 month-old pitbull puppy at the time, who was placed in a plastic bag and thrown from a moving car. 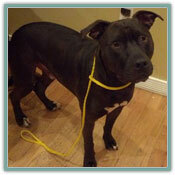 Thank you to all those who have sent donations to help continue his medical care.